Life Blood by Penny Rudolph, a Mysterious Review. 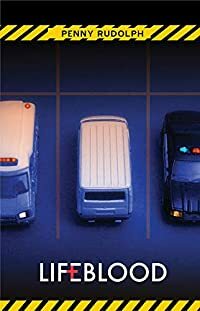 Review: Los Angeles parking garage owner Rachel Chavez finds herself involved in the activities of a mysterious hospital in Life Blood, the second entry in this series by Penny Rudolph. Life Blood starts out with an intriguing premise. Rachel finds two children in an apparently abandoned van in her garage. Rushing them to the nearest hospital, she's informed that one is dead and the other alive in critical condition. Returning the next day to follow up on the one that survived, she's told there is no record of two children having ever been there the day before, dead or alive. When she continues to investigate on her own, she's accused of stealing a controlled substance from the hospital and arrested. Later, an attempt is made on her life. She's convinced that the two missing children are the key to understanding why someone wants, at a minimum, to see her in jail or worse, dead. Following a strong opening, however, Life Blood rapidly loses its way. Part of the problem is in the shifting points of view that add no real value and have the unfortunate effect of specifically lessening any mystery associated with the hospital and its staff. In addition, there are oddly placed and completely irrelevant side stories dealing with Rachel's father. There are also attempts at injecting elements of a medical suspense thriller here and there but none are successful. Rudolph challenges the reader of Life Blood with a couple of fundamental questions. Does the end result justify the means? Is there a greater good? There is never an easy answer to either one, but in the case as presented in this book, it should be an unequivocal and resounding no. It is shocking, therefore, that in the end Rachel not only calmly accepts the situation, but makes a seriously flawed decision that not only makes her complicit in the crimes being committed but a moral hypocrite as well. It is rare that a book starts so promisingly yet ends so poorly. Life Blood is a disappointment in every sense of the word. Acknowledgment: Poisoned Pen Press provided an ARC of Life Blood for this review.